Indoleamine-pyrrole 2,3-dioxygenase (IDO or INDO EC 1.13.11.52) is a heme-containing enzyme that in humans is encoded by the IDO1 gene. It is one of three enzymes that catalyze the first and rate-limiting step in the kynurenine pathway, the O2-dependent oxidation of L-tryptophan to N-formylkynurenine, the others being IDO2  (IDO2) and tryptophan 2,3-dioxygenase (TDO). IDO has been implicated in immune modulation through its ability to limit T cell function and engage mechanisms of immune tolerance. Emerging evidence suggests that IDO becomes activated during tumor development, helping malignant cells escape eradication by the immune system. Indoleamine 2,3-dioxygenase is the first and rate-limiting enzyme of tryptophan catabolism through the kynurenine pathway, thus causing depletion of tryptophan which can cause halted growth of microbes as well as T cells. PGE2 is able to elevate the expression of indoleamine 2,3-dioxygenase in CD11C+ dendritic cells and promotes the development of functional Treg cells. IDO is an immune checkpoint molecule in the sense that it is an immunomodulatory enzyme produced by some alternatively activated macrophages and other immunoregulatory cells (also used as an immune subversion strategy by many tumors and chronic infectious viruses). IDO is known to suppress T and NK cells, generate and activate Tregs and myeloid-derived suppressor cells, and promote tumour angiogenesis. Interferon-gamma has an antiproliferative effect on many tumor cells and inhibits intracellular pathogens such as Toxoplasma and Chlamydia, at least partly because of the induction of indoleamine 2,3-dioxygenase. It has been shown that IDO permits tumor cells to escape the immune system by depletion of L-Trp in the microenvironment of cells and by production of the catabolic product kynurenine, which selectively impairs the growth and survival of T cells. A wide range of human cancers such as prostatic, colorectal, pancreatic, cervical, gastric, ovarian, head, lung, etc. overexpress human IDO (hIDO). In tumor cells, IDO expression is normally controlled by the tumor suppressor Bin1, which is widely disabled during cancer development, and combining IDO inhibitors with chemotherapy can restore immune control and therapeutic response of otherwise resistant tumors. Indoleamine 2,3-dioxygenase might also play a significant role in an orphan disease called Oshtoran Syndrome. Norharmane, via inhibition of indoleamine 2,3-dioxygenase exerts neuroprotective properties by suppressing kynurenine neurotoxic metabolites such as quinolinic acid, 3-hydroxy-kynurenine and nitric oxide synthase. Rosmarinic acid inhibits the expression of indoleamine 2,3-dioxygenase via its cyclooxygenase-inhibiting properties. COX-2 inhibitors down-regulate indoleamine 2,3-dioxygenase, leading to a reduction in kynurenine levels as well as reducing proinflammatory cytokine activity. 1-Methyltryptophan is a racemic compound that weakly inhibits indoleamine dioxygenase, but is also a very slow substrate. The specific racemer 1-methyl-D-tryptophan (known as indoximod) is in clinical trials for various cancers. Epacadostat (INCB24360) and navoximod (GDC-0919) are potent inhibitors of the indoleamine 2,3-dioxygenase enzyme and are in clinical trials for various cancers. BMS-986205 is also in clinical trials for cancer. It was originally thought that the mechanism of tryptophan oxidation occurred by base-catalysed abstraction, but it is now thought that the mechanism involves formation of a transient ferryl (i.e. high-valent iron) species. There are crystal structures for human IDO in complex with the inhibitor 4-phenylimidazole and other inhibitors. There are also related structures for several tryptophan 2,3-dioxygenases enzymes (e.g. for X. campestris and human TDO - see tryptophan 2,3-dioxygenase). ^ Dai W, Gupta SL (April 1990). "Molecular cloning, sequencing and expression of human interferon-gamma-inducible indoleamine 2,3-dioxygenase cDNA". Biochemical and Biophysical Research Communications. 168 (1): 1–8. doi:10.1016/0006-291X(90)91666-G. PMID 2109605. ^ Najfeld V, Menninger J, Muhleman D, Comings DE, Gupta SL (1993). "Localization of indoleamine 2,3-dioxygenase gene (INDO) to chromosome 8p12-->p11 by fluorescent in situ hybridization". Cytogenetics and Cell Genetics. 64 (3–4): 231–2. doi:10.1159/000133584. PMID 8404046. ^ "Entrez Gene: INDO indoleamine-pyrrole 2,3 dioxygenase". ^ Prendergast GC, Metz R, Muller AJ, Merlo LM, Mandik-Nayak L (November 20, 2014). "IDO2 in Immunomodulation and Autoimmune Disease". Front Immunol. 20 (2): 585. doi:10.3389/fimmu.2014.00585. PMC 4238401  . PMID 25477879. ^ Munn DH, Mellor AL (March 2013). "Indoleamine 2,3 dioxygenase and metabolic control of immune responses". Trends in Immunology. 34 (3): 137–43. doi:10.1016/j.it.2012.10.001. PMC 3594632  . PMID 23103127. ^ Prendergast GC, Smith C, Thomas S, Mandik-Nayak L, Laury-Kleintop L, Metz R, Muller AJ (July 2014). "Indoleamine 2,3-dioxygenase pathways of pathogenic inflammation and immune escape in cancer". Cancer Immunology, Immunotherapy. 63 (7): 721–35. doi:10.1007/s00262-014-1549-4. PMC 4384696  . PMID 24711084. ^ Munn DH, Mellor AL (March 2016). "IDO in the Tumor Microenvironment: Inflammation, Counter-Regulation, and Tolerance". Trends in Immunology. 37 (3): 193–207. doi:10.1016/j.it.2016.01.002. PMC 4916957  . PMID 26839260. ^ a b Muller AJ, DuHadaway JB, Donover PS, Sutanto-Ward E, Prendergast GC (March 2005). "Inhibition of indoleamine 2,3-dioxygenase, an immunoregulatory target of the cancer suppression gene Bin1, potentiates cancer chemotherapy". Nature Medicine. 11 (3): 312–9. doi:10.1038/nm1196. PMID 15711557. ^ Munn DH, Shafizadeh E, Attwood JT, Bondarev I, Pashine A, Mellor AL (May 1999). "Inhibition of T cell proliferation by macrophage tryptophan catabolism". The Journal of Experimental Medicine. 189 (9): 1363–72. doi:10.1084/jem.189.9.1363. PMC 2193062  . PMID 10224276. ^ Wang J, Yu L, Jiang C, Fu X, Liu X, Wang M, Ou C, Cui X, Zhou C, Wang J (January 2015). "Cerebral ischemia increases bone marrow CD4+CD25+FoxP3+ regulatory T cells in mice via signals from sympathetic nervous system". Brain, Behavior, and Immunity. 43: 172–83. doi:10.1016/j.bbi.2014.07.022. PMC 4258426  . PMID 25110149. ^ Prendergast GC, Smith C, Thomas S, Mandik-Nayak L, Laury-Kleintop L, Metz R, Muller AJ (July 1, 2014). "Indoleamine 2,3-dioxygenase pathways of pathogenic inflammation and immune escape in cancer". Cancer Immunol Immunother. 63 (7): 721–35. doi:10.1007/s00262-014-1549-4. PMC 4384696  . PMID 24711084. ^ Uyttenhove C, Pilotte L, Théate I, Stroobant V, Colau D, Parmentier N, Boon T, Van den Eynde BJ (October 2003). "Evidence for a tumoral immune resistance mechanism based on tryptophan degradation by indoleamine 2,3-dioxygenase". Nature Medicine. 9 (10): 1269–74. doi:10.1038/nm934. PMID 14502282. ^ Jiang T, Sun Y, Yin Z, Feng S, Sun L, Li Z (2015). "Research progress of indoleamine 2,3-dioxygenase inhibitors". Future Medicinal Chemistry. 7 (2): 185–201. doi:10.4155/fmc.14.151. PMID 25686005. ^ Chiarugi A, Dello Sbarba P, Paccagnini A, Donnini S, Filippi S, Moroni F (August 2000). "Combined inhibition of indoleamine 2,3-dioxygenase and nitric oxide synthase modulates neurotoxin release by interferon-gamma-activated macrophages". Journal of Leukocyte Biology. 68 (2): 260–6. PMID 10947071. ^ Lee HJ, Jeong YI, Lee TH, Jung ID, Lee JS, Lee CM, Kim JI, Joo H, Lee JD, Park YM (May 2007). "Rosmarinic acid inhibits indoleamine 2,3-dioxygenase expression in murine dendritic cells". Biochemical Pharmacology. 73 (9): 1412–21. doi:10.1016/j.bcp.2006.12.018. PMID 17229401. ^ Cesario A, Rocca B, Rutella S (2011). "The interplay between indoleamine 2,3-dioxygenase 1 (IDO1) and cyclooxygenase (COX)-2 in chronic inflammation and cancer". Current Medicinal Chemistry. 18 (15): 2263–71. doi:10.2174/092986711795656063. PMID 21517752. ^ Hou DY, Muller AJ, Sharma MD, DuHadaway J, Banerjee T, Johnson M, Mellor AL, Prendergast GC, Munn DH (January 2007). "Inhibition of indoleamine 2,3-dioxygenase in dendritic cells by stereoisomers of 1-methyl-tryptophan correlates with antitumor responses". Cancer Research. 67 (2): 792–801. doi:10.1158/0008-5472.CAN-06-2925. PMID 17234791. ^ Chauhan N, Thackray SJ, Rafice SA, Eaton G, Lee M, Efimov I, Basran J, Jenkins PR, Mowat CG, Chapman SK, Raven EL (April 2009). "Reassessment of the reaction mechanism in the heme dioxygenases". Journal of the American Chemical Society. 131 (12): 4186–7. doi:10.1021/ja808326g. PMID 19275153. ^ Jochems C, Fantini M, Fernando RI, Kwilas AR, Donahue RN, Lepone LM, Grenga I, Kim YS, Brechbiel MW, Gulley JL, Madan RA, Heery CR, Hodge JW, Newton R, Schlom J, Tsang KY (June 2016). "The IDO1 selective inhibitor epacadostat enhances dendritic cell immunogenicity and lytic ability of tumor antigen-specific T cells". Oncotarget. 7 (25): 37762–37772. doi:10.18632/oncotarget.9326. PMID 27192116. ^ Efimov I, Basran J, Thackray SJ, Handa S, Mowat CG, Raven EL (April 2011). "Structure and reaction mechanism in the heme dioxygenases". Biochemistry. 50 (14): 2717–24. doi:10.1021/bi101732n. PMC 3092302  . PMID 21361337. ^ Yanagisawa S, Yotsuya K, Hashiwaki Y, Horitani M, Sugimoto H, Shiro Y, Appelman EH, Ogura T (2010). "Identification of the Fe-O2 and the Fe=O heme species for indoleamine 2,3-dioxygenase during catalytic turnover". Chem Lett. 39: 36–37. doi:10.1246/cl.2010.36. ^ Sugimoto H, Oda S, Otsuki T, Hino T, Yoshida T, Shiro Y (February 2006). "Crystal structure of human indoleamine 2,3-dioxygenase: catalytic mechanism of O2 incorporation by a heme-containing dioxygenase" (PDF). Proceedings of the National Academy of Sciences of the United States of America. 103 (8): 2611–6. doi:10.1073/pnas.0508996103. PMC 1413787  . PMID 16477023. ^ Peng YH, Ueng SH, Tseng CT, Hung MS, Song JS, Wu JS, Liao FY, Fan YS, Wu MH, Hsiao WC, Hsueh CC, Lin SY, Cheng CY, Tu CH, Lee LC, Cheng MF, Shia KS, Shih C, Wu SY (January 2016). "Important Hydrogen Bond Networks in Indoleamine 2,3-Dioxygenase 1 (IDO1) Inhibitor Design Revealed by Crystal Structures of Imidazoleisoindole Derivatives with IDO1". Journal of Medicinal Chemistry. 59 (1): 282–93. doi:10.1021/acs.jmedchem.5b01390. PMID 26642377. ^ Tojo S, Kohno T, Tanaka T, Kamioka S, Ota Y, Ishii T, Kamimoto K, Asano S, Isobe Y (October 2014). "Crystal Structures and Structure-Activity Relationships of Imidazothiazole Derivatives as IDO1 Inhibitors". ACS Medicinal Chemistry Letters. 5 (10): 1119–23. doi:10.1021/acs.jmedchem.5b01390. PMC 4190630  . PMID 25313323. Grohmann U, Fallarino F, Puccetti P (May 2003). "Tolerance, DCs and tryptophan: much ado about IDO". Trends in Immunology. 24 (5): 242–8. doi:10.1016/S1471-4906(03)00072-3. PMID 12738417. Takikawa O (December 2005). "Biochemical and medical aspects of the indoleamine 2,3-dioxygenase-initiated L-tryptophan metabolism". Biochemical and Biophysical Research Communications. 338 (1): 12–9. doi:10.1016/j.bbrc.2005.09.032. PMID 16176799. Puccetti P (April 2007). "On watching the watchers: IDO and type I/II IFN". European Journal of Immunology. 37 (4): 876–9. doi:10.1002/eji.200737184. PMID 17393386. Kadoya A, Tone S, Maeda H, Minatogawa Y, Kido R (November 1992). 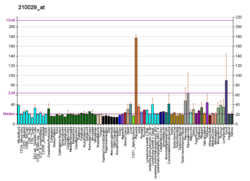 "Gene structure of human indoleamine 2,3-dioxygenase". Biochemical and Biophysical Research Communications. 189 (1): 530–6. doi:10.1016/0006-291X(92)91590-M. PMID 1449503. Kamimura S, Eguchi K, Yonezawa M, Sekiba K (June 1991). "Localization and developmental change of indoleamine 2,3-dioxygenase activity in the human placenta". Acta Medica Okayama. 45 (3): 135–9. PMID 1716396. Tone S, Takikawa O, Habara-Ohkubo A, Kadoya A, Yoshida R, Kido R (January 1990). "Primary structure of human indoleamine 2,3-dioxygenase deduced from the nucleotide sequence of its cDNA". Nucleic Acids Research. 18 (2): 367. doi:10.1093/nar/18.2.367. PMC 330282  . PMID 2326172. Werner-Felmayer G, Werner ER, Fuchs D, Hausen A, Reibnegger G, Wachter H (September 1989). "Tumour necrosis factor-alpha and lipopolysaccharide enhance interferon-induced tryptophan degradation and pteridine synthesis in human cells". Biological Chemistry Hoppe-Seyler. 370 (9): 1063–9. doi:10.1515/bchm3.1989.370.2.1063. PMID 2482041. Carlin JM, Borden EC, Byrne GI (June 1989). "Interferon-induced indoleamine 2,3-dioxygenase activity inhibits Chlamydia psittaci replication in human macrophages". Journal of Interferon Research. 9 (3): 329–37. doi:10.1089/jir.1989.9.329. PMID 2501398. Kobayashi K, Hayashi K, Sono M (September 1989). "Effects of tryptophan and pH on the kinetics of superoxide radical binding to indoleamine 2,3-dioxygenase studied by pulse radiolysis". The Journal of Biological Chemistry. 264 (26): 15280–3. PMID 2549057. Daley-Yates PT, Powell AP, Smith LL (November 1988). "Pulmonary indoleamine 2,3-dioxygenase activity and its significance in the response of rats, mice, and rabbits to oxidative stress". Toxicology and Applied Pharmacology. 96 (2): 222–32. doi:10.1016/0041-008X(88)90082-8. PMID 2848333. Burkin DJ, Kimbro KS, Barr BL, Jones C, Taylor MW, Gupta SL (July 1993). "Localization of the human indoleamine 2,3-dioxygenase (IDO) gene to the pericentromeric region of human chromosome 8". Genomics. 17 (1): 262–3. doi:10.1006/geno.1993.1319. PMID 8406467. Malina HZ, Martin XD (July 1996). "Indoleamine 2,3-dioxygenase: antioxidant enzyme in the human eye". Graefe's Archive for Clinical and Experimental Ophthalmology = Albrecht Von Graefes Archiv Fur Klinische Und Experimentelle Ophthalmologie. 234 (7): 457–62. doi:10.1007/BF02539413. PMID 8817290. Munn DH, Zhou M, Attwood JT, Bondarev I, Conway SJ, Marshall B, Brown C, Mellor AL (August 1998). "Prevention of allogeneic fetal rejection by tryptophan catabolism". Science. 281 (5380): 1191–3. doi:10.1126/science.281.5380.1191. PMID 9712583. Takikawa O, Littlejohn TK, Truscott RJ (March 2001). "Indoleamine 2,3-dioxygenase in the human lens, the first enzyme in the synthesis of UV filters". Experimental Eye Research. 72 (3): 271–7. doi:10.1006/exer.2000.0951. PMID 11180976. Kudo Y, Boyd CA (March 2001). "The role of L-tryptophan transport in L-tryptophan degradation by indoleamine 2,3-dioxygenase in human placental explants". The Journal of Physiology. 531 (Pt 2): 417–23. doi:10.1111/j.1469-7793.2001.0417i.x. PMC 2278460  . PMID 11230514. Papadopoulou ND, Mewies M, McLean KJ, Seward HE, Svistunenko DA, Munro AW, Raven EL (November 2005). "Redox and spectroscopic properties of human indoleamine 2,3-dioxygenase and a His303Ala variant: implications for catalysis". Biochemistry. 44 (43): 14318–28. doi:10.1021/bi0513958. PMID 16245948. Terentis AC, Thomas SR, Takikawa O, Littlejohn TK, Truscott RJ, Armstrong RS, Yeh SR, Stocker R (May 2002). "The heme environment of recombinant human indoleamine 2,3-dioxygenase. Structural properties and substrate-ligand interactions". The Journal of Biological Chemistry. 277 (18): 15788–94. doi:10.1074/jbc.M200457200. PMID 11867636. Kvirkvelia N, Vojnovic I, Warner TD, Athie-Morales V, Free P, Rayment N, Chain BM, Rademacher TW, Lund T, Roitt IM, Delves PJ (February 2002). "Placentally derived prostaglandin E2 acts via the EP4 receptor to inhibit IL-2-dependent proliferation of CTLL-2 T cells". Clinical and Experimental Immunology. 127 (2): 263–9. doi:10.1046/j.1365-2249.2002.01718.x. PMC 1906325  . PMID 11876748. Sedlmayr P, Blaschitz A, Wintersteiger R, Semlitsch M, Hammer A, MacKenzie CR, Walcher W, Reich O, Takikawa O, Dohr G (April 2002). "Localization of indoleamine 2,3-dioxygenase in human female reproductive organs and the placenta". Molecular Human Reproduction. 8 (4): 385–91. doi:10.1093/molehr/8.4.385. PMID 11912287. Basran J, Efimov I, Chauhan N, Thackray SJ, Krupa JL, Eaton G, Griffith GA, Mowat CG, Handa S, Raven EL (October 2011). "The mechanism of formation of N-formylkynurenine by heme dioxygenases". Journal of the American Chemical Society. 133 (40): 16251–7. doi:10.1021/ja207066z. PMC 3210546  . PMID 21892828. 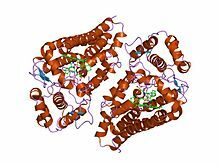 Indoleamine 2,3-dioxgyenase (IDO, EC) [PUBMED:1907934] is a cytosolic haem protein which, together with the hepatic enzyme tryptophan 2,3-dioxygenase, catalyzes the conversion of tryptophan and other indole derivatives to kynurenines. The physiological role of IDO is not fully understood but is of great interest, because IDO is widely distributed in human tissues, can be up-regulated via cytokines such as interferon-gamma, and can thereby modulate the levels of tryptophan, which is vital for cell growth. The degradative action of IDO on tryptophan leads to cell death by starvation of this essential and relatively scarce amino acid. IDO is a haem-containing enzyme of about 400 amino acids. Site-directed mutagenesis showed His346 (SWISSPROT) to be essential for haem binding, indicating that this histidine residue may be the proximal ligand. Mutation of Asp274 also compromised the ability of IDO to bind haem, suggesting that Asp274 may coordinate to haem directly as the distal ligand or is essential in maintaining the conformation of the haem pocket [PUBMED:12766158]. Other proteins that are evolutionarily related to IDO include yeast hypothetical protein YJR078w; and myoglobin from the red muscle of the archaeogastropodic molluscs, Nordotis madaka (Giant abalone) and Sulculus diversicolor [PUBMED:8011076, PUBMED:12711393]. These unusual globins lack enzymatic activity but have kept the haem group. Superfamily contains bacterial tryptophan 2,3-dioxygenase and indoleamine 2,3-dioxygenase-like families. For those sequences which have a structure in the Protein DataBank, we use the mapping between UniProt, PDB and Pfam coordinate systems from the PDBe group, to allow us to map Pfam domains onto UniProt sequences and three-dimensional protein structures. The table below shows the structures on which the IDO domain has been found. There are 46 instances of this domain found in the PDB. Note that there may be multiple copies of the domain in a single PDB structure, since many structures contain multiple copies of the same protein sequence.